Early stress has the largest impact on yield. Did you know that, on average, most seeds only yield between 25 and 40 percent of their full potential? We know this from witnessing record yields on commodity crops such as canola, corn or beans. But why aren't more farmers producing higher yields? The answer is stress. There are many sources of stress for a plant. Some of these include moisture, temperature, nutrient deficiency, light, pests, etc. As we walk through the plant growth cycle, we can examine the most common of these stress factors. At each stage of a plant's life, various stresses have different effects. It may seem overly obvious but, we all know that if a seed doesn't get enough water, it won't germinate. Less obvious potential stresses are soil termperature, and nutrient availability. Availability of nutrients is a key factor for every stage of a plant's life. In corn, much of the plant's yield has been determined before V3. This is why it is very important to make sure that the early stages of the plant's life are low in stress. In soybeans, the flowering stage is critical time for setting pods. The more flowers, the more pods are set. The more pods that are set, the higher the potential yield. Successful stress management is the best way to decrease yield loss. Think of your young seedling as a vulnerable baby that can not fend for itself. 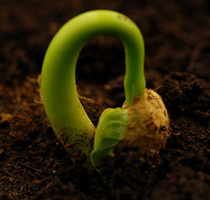 The seedling needs to be provided with many things, the most important of which includes adequate moisture, proper temperature and a steady diet of balanced nutrition. Once germinated, a seed draws nutrients immediately from its storage tank - the energetic material of the seed, itself. But, the seed's storage tank is small and only has enough energy to sustain the development of a few small root hairs and an upward shoot and then, it is quickly depleted. After that, a seedling needs to get nutrients from external inputs. As a farmer, you can't control temperature or moisture. But you can control nutrition. You have two choices. You can supply nutrition in the form of available fertilizer, supplied directly to the plant or you can foster a healthy soil environment that can supply the tender plant with what it needs. Most soils are chock full of nutrients. But most of these nutrients are in a raw or reserved form in the soil. Rock Phosphate and Calcium are hard granular materials. So, how does a plant eat a bunch of rocks? It doesn't. A healthy soil environment contains an army of microbes that convert the "rocks" to an available form. This process is called solubilizing. With traditional high-salt fertilizers, chemical processes have been employed to do the job of the microbes in order to extract nutrients from the "rocks" and make them available to plants. But the chemical forms of these nutrients kill the soil's microbes. So, this leaves your plants dependent on you to supply all their nutrients and leaves you with a dead soil. Use of chemical fertilizers leaves you with a soil system that is dependent on purchased inputs. In addition, it is more difficult to achieve balance with purchased inputs. Imbalances mean a combination of deficiency and excess which translate to unhealthy plants that are more susceptible to disease and insect pressure. Dead soil has no water holding capacity, is easily compacted so roots can't navigate through it, and fosters no beneficial microbes and other organisms like worms that serve as your fertilizer production army. Dead soil is bad for good farming. Make your soil come alive again by reducing chemical fertilizers and other chemical applications. Stimulate the microbes in your soil by feeding them with organic material. Make sure your soil contains the micronutrients that enable microbes to complete critical enzymatic processes and allow them to digest and release nutrients available to your plants. Stimulate dead or unhealthy soils with an inoculant of our TrueBlend Soil Rejuvenator to activate the army of little workers under your feet. Then, feed your plants with natural, high quality, highly available nutrients to give them the jump they need while your microbes are building their strength. Consider spraying Agri-Gro FoliarBlend bio-stimulant or our comprehensive, all-natural TrueBlend Planting and Foliar solutions in the row at planting or on your new crops as a foliar for a strong start. Did you know that the first 9 days of a corn plant's life will determine its yield potential? There's theoretical genetic potential...which is the amount of production that a plant has been genetically programmed to produce, if all conditions were exactly perfect. Then there's what I'll call practical genetic potential. This is the potential that a plant has to product, given typical (less than perfect) conditions. You may have heard citings of research that suggest that corn seed has the genetic potential to produce 1100 bu/acre. We know that our best farmers see 200-300 bu/ac depending on conditions, most of which are out of their immediate control (sunlight, water, soil nutrient availability, etc.). So, the "1100 bu/acre" would be the theoretical potential while the "200-300 bu/acre" is the practical potential. Most farmers don't even come close to the practical potential as they are not even doing what they can control (nutrient supply) to help that plant reach its practical potential. At the beginning of the plant's life, and given the conditions at the time, the plant makes its determination as to what it can (has the potential to) produce. If it determines two cobs, then, the potential for that plant will never be more than two cobs. If it determines 14 rows, then, the potential for the cobs will never be more than 14 rows. If its 70 kernels per row, then, the potential for the rows will never be more than 70 kernels. The plant determines all this very early and will determine based on its conditions at the time of determination. So, as the season progresses, the plant passes through growth stages, as which time, it will INITIATE certain processes such as cob initiation, pollination, row initiation, kernel initiation, kernel fill. At each of these stages, if the conditions are not right, ...even if the potential for two cobs was determined, it may not form two cobs. That's why its very important for the plant to have the right nutrients at these critical stages of its life. At each stage, there is the chance that, if the conditions are not ideal, the plant will not initiate the given process and YEILD is LOST. Obviously, if it doesn't initiate both cobs that were determined, then you automatically lost potential for 1/2 the yield. And, of course, as you know, just because you initiate a cob, doesn't mean that the cob will fully pollinated and even if fully pollinated, doesn't mean that the kernels will be initiated. Even if the kernels are initiated, doens't mean that they will all fill. Again, at each stage, there is the potential to lose yield, unless ideal conditions are presented. This is why the theoretical potential is never realized. Because the plant will NOT see ideal conditions at each stage and yield is inevitably lost at each stage. You are right with your timings in that these timings refer to when the plant is initiating certain processes and, it is at these times when it is critical for the plant to have all its necessary inputs to perform the initiation to the fullest of its practical potential. 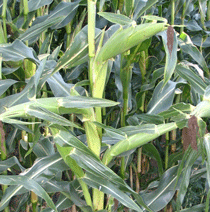 Corn Hybrid has an awful lot to do with how the plant will or can react. Some hybrids are bred to only produce one cob......all you can do is support that one-cob plant with the right planting depth and spacing so as to allow for the most ideal conditions for that plant...and do all that you can do to make that one cob the most it can be. longer and thicker for more rows and more kernels.....more mass.